"Space. The continual becoming: invisible fountain from which all rhythms flow and to which they must pass. Beyond time or infinity"
He was an exaggerator, a provocateur and an arrogant. He's the most hated one by his colleagues. Architects try to silently underestimate Ol' Frankie when ever they can. But thank god none has the pingpongs to do so boldly! To tell the truth I'm not a die heart fan of most of his works either. But I know to appreciate him, as The Architect. His courage, his self esteem, his vision.. There was this hatred going on around him when he was alive too. He had to run away from cops once just because he fell in love. 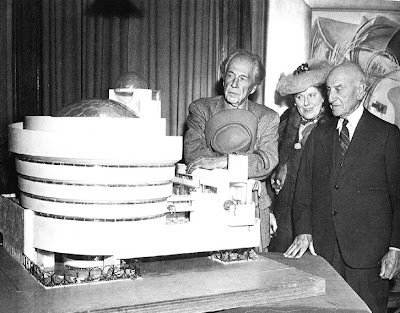 The architects declared their hate for him late his career and our Ol' Frankie Shut 'em Down with his Guggenheim N.Y.
Now that building to me is The Ninth Symphony Presto composed in concrete. This is why haters today should endure in silence. Because he can kick bottoms no matter if he's dead or alive. Weapons of Mass Deception won't suffice for such a Statement! Today we have this mediocre, this magazine architecture. Starchitect wanna be's are after creating buildings that can give one or two good photos. This became the way of drawing attention. Not the quality of space. Infact no one talks about the space anymore. Can you imagine any architect today, who's just been asked for a house by a waterfall, persuading the client to a deeper understanding of human and nature? When I was in high school they used to teach us Space as the ultimate emptiness that surrounds all the planets and stars. Today Physicists say that with all the strings wiggling and the spacetime woven in it's fabric, Space is far from emptiness. Infact there's more going on in the space than what's happening in the stars and planets! Sounds like Ol' Frankie? Wright? A good architecture is drawing a movie. A movie that defines a living within. You put all the ingredient into the project to kick start life. Good architecture seeks this mystery. Not a beautiful corpse that looks good in magazines. Both scientifically and architecturally, Space is the habitat of life. Easy to say. Hard to swallow. Some are aware of it, some become after a near death experience, some just can't..